Inspector Boarder is a lockdown card that anyone can use, and lends a great deal of power to Anti-Meta. Stopping it from being summoned unless you have zero monsters is a unique restriction that is reminiscent of high ATK Level 4 monsters early on in the game having weird restrictions. 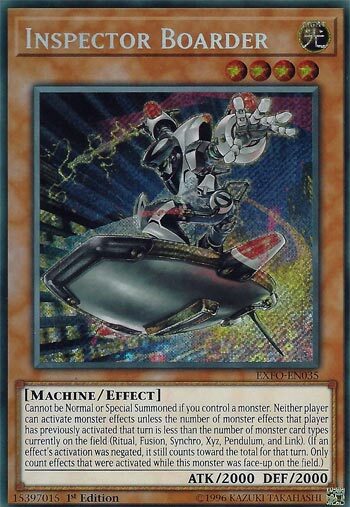 Once on the field it locks down everyone from activating monster effects below the number of Extra Deck monsters on the field. If there is less than two Extra Deck monsters on the field your opponent won’t be activating ANY monster effect. Grave effects, hand traps are locked down as well. Topdecking this card late in the game can almost seal the victory. Even if your opponent can activate effects you can negate them and they count towards the number of activated effects. Counter Fairies can seriously cause problems with this card on the field and their backrow filled with Counter Traps. Anti-Meta gets a powerful Level 4 that can be a first turn lockdown card run in 3’s. Any deck can run this in the Side Deck and play around it if they can summon Inspector and develop their field in the same turn. If your opponent doesn’t play an Extra Deck (certain Monarch decks) you have an even greater chance of locking your opponent down. A great card that is worth investing in. Inspector Boarder is a Level 4 Light Machine-type monster with 2000 Atk and 2000 Def. Firstly, that artwork is awesome. I see this and think of that level from tmnt: Turtles in Time. Anyway, with such a good stats it of course can only be Normal or Special Summoned if you control no monsters. That would have been enough to play this as a beat stick somewhere. But the real ability is that this card counts the number of Special Monsters on either field, and then it prevents all monster activations after that previously counted number. It even counts activations that were negated towards the new monster effect limit. So, if you have successfully summoned a Fusion Monster, you can use one monster effect while Inspector Boarder is on the field. A Fusion and a Ritual equals 2 monster effects, and so on and so on. This can hinder both players, but obviously, whoever gets it out first should have a plan to Summon more Special Monsters and thus gain more monster effects. Inspector Boarder is an excellent opening move because it prevents Hand Traps from working against you, particularly turn one. In closing, good stats and a good effect equal an awesome card. Stun players rejoice, because you got a new tool to the arsenal, and a great one at that in Inspector Boarder. Inspector Boarder is a Light Machine Level 4 monster with 2000 ATK and DEF. Stats are outstanding for a Level 4, though this means there is a drawback, type and attribute are good, and level is favorable. Boarder cannot be Normal Summoned or Special Summoned while you control a monster, so this has to be the first thing you summon to make good use of him. While on the field, a player can only activate monster effects up to the number of different monster types they control of the following: Ritual, Fusion, Synchro, Xyz, Pendulum, or Link. Basically you need an Extra Deck monster to use monster effects, or a Ritual. Some notes are that the monster effects negated will only count when this thing hits the field, so you can use some sort of hand-trap before summoning this guy or something, I don’t know how much that part will come into play. I guess reviving it on the opponent’s turn. Also a negated effect will count towards the effect count used, so hope your one effect doesn’t get negated if you only control one of the card types listed previously. It can be confusing to explain, but you should be able to understand it when reading the card. It is a very powerful stun card, with a balance of it having to be the first monster you summon or you can only summon it when you have no monsters left. Also of note, this does not stop continuous monster effects like Piercing Damage. It is a great card for stun decks, worth playing if you play stun. A Level 4 Monster with 2000 attack (and defense)…there can’t be any conditions, clauses, or catches here, right? Apparently I was mistaken…seriously though. Light and Machine are good, always good to start at the top. Can’t be Normal or Special Summoned if you control a Monster. Nothing here about what your opponent can or can’t control, so that’s not a huge drawback, but that will mean Inspector Boarder will be a dead draw sometimes. There’s a lot of text on this card, but it boils down to the either player can only use one Monster Effect per turn per the type of Monster(s) they have on the Field. Worth noting, also on the card, negated effects count toward the total you’re allowed to use. This is one of those cards I feel is going to be very hyped, but people are going to be confused and angry, and he’ll fall aside, but people are going to need him later and figure it out, and he’s going to come roaring back. It’s a Tech card of sorts, but a smart player’s Tech. You do have to run enough different types to make this work in your favor, and not just throw it in and hope it works out for you. It very likely won’t. Next articleUSB Type-C: Why Do We Need It?